Anyone may make nomination to the LHOF. Nominees may be individuals or organizations. To be eligible, a nominee must have made a substantial contribution to the leather community dating back at least 25 years. A nomination may include a preliminary biography of the nominee, and at a minimum should include a brief summary of the nominee's accomplishments. The annual deadline for nominations is October 15th. 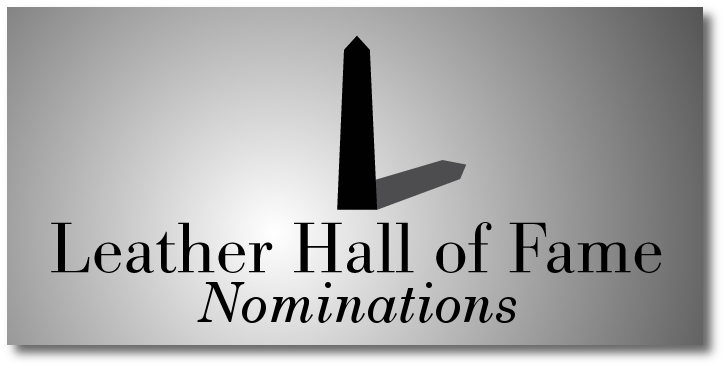 The LHOF shall research the accuracy of the nominations and modify and supplement the nomination with any pertinent information. Nominations are voted on by the Board of Governors in late November. Three nominations will be chosen each year for induction into the Leather Hall of Fame. The Leather Hall of Fame (LHOF) represents all people in the modern leather community around the World, without regard to gender or sexual orientation. There are no quotas based on gender, location, sexual orientation or any other factor. Invalid Input "Also Known As"
Please provide any information concerning the accomplishments of the nominee. Be complete as possible.